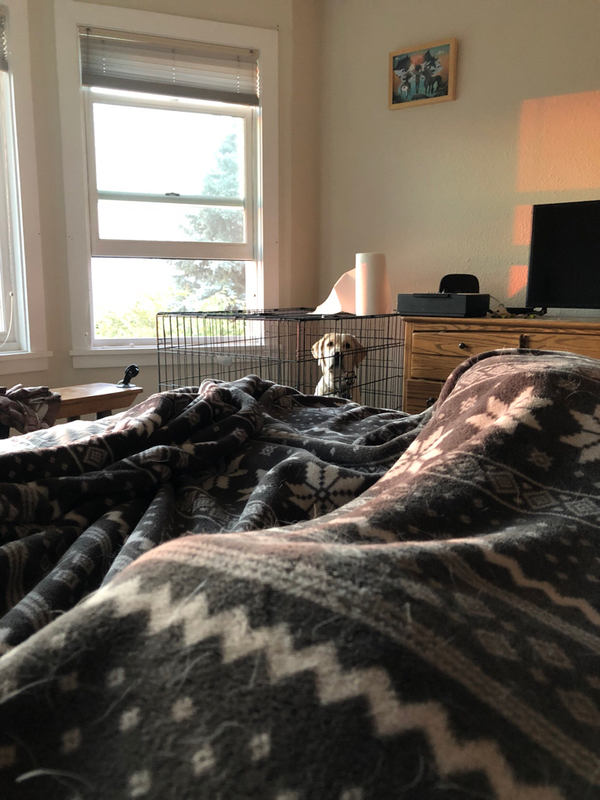 Barley is tall enough now that he can see how he is missing out on morning cuddles from his crate! This is my normal view as I wake up in the morning, and the lumps under the blanket are Thor. Don’t worry, Barley, you’ll be up here soon enough. How adorable! I get that too with Asher. I've tested him out on the bed. Didn't go so well. Each time one of the kitties visits and then jumps down, he follows kitty. While on vacations, he will sleep on the bed and not jump down. We are still sleeping downstairs on a mattress right beside Ashers crate. After snuggling with Samson for one snooze, I open the crate and snuggle with Asher and Samson for two snoozes. It's so cute. I love my mornings. Barley is growing so fast!!! Very handsome. Awww look at those sad eyes. Like what about me. Haha, "Mom get I can out now?" Awwwwwww he looks so sad it's pitiful!!!! Don't worry Barley, your time will come! You know your going to need a bigger bed. Love the ever present roll of paper towels! I can totally relate! !